EPA's press shop is taking a page from President Trump's playbook. Since the new administration entered office, the staff in EPA's press shop has gotten personal with reporters — calling out their alleged mistakes in press releases, keeping them off advisories and blocking some from agency events. The combative approach calmed a bit when acting EPA Administrator Andrew Wheeler took over for Scott Pruitt, who resigned over the summer, but now it appears to be intensifying again. It comes as Trump has been making waves with his own treatment of the press. In the most recent uproar, the White House is under fire for revoking a CNN reporter's press badge following a confrontational episode during a news conference last week. CNN today sued the Trump administration, demanding that the press credentials be returned to reporter Jim Acosta. Environmentalists and press freedom advocates warn that the White House and EPA are setting a troubling precedent. They say the public isn't getting adequate information as the EPA press shop spends its time launching personal attacks against reporters. "When your president calls the press an 'enemy of the people' and has a very confrontational style with respect to the press, that trickles down," said Nick Conger, a former EPA spokesman during the Obama administration. Conger now serves as communications director for former Vice President Al Gore. Pruitt's press team launched with an aggressive approach, lobbing insults at individual reporters and barring certain news outlets from an event on hazardous chemicals (Greenwire, May 22). At the center of that approach: Jahan Wilcox, a GOP operative who had worked on Florida Sen. Marco Rubio's 2016 presidential campaign and at the Republican National Committee before he landed at Trump's EPA. Wilcox called Elaina Plott, a staff writer for The Atlantic, a "piece of trash" after she reported on a top Pruitt aide leaving the agency in June. He later apologized. He also dismissed an E&E News reporter seeking information about Pruitt using his personal email address for official business: "You can use this thing called Google, which searches websites on the internet." Another Pruitt-era press aide was Liz Bowman, a seasoned public relations official who had done stints at the Pew Charitable Trusts and the American Chemistry Council. Under Wilcox and Bowman, the EPA press shop was known to blast out stories from conservative news outlets such as The Daily Caller, The Weekly Standard or The Washington Free Beacon. Many of the stories praised Pruitt's leadership of the agency or accused newspapers such as The New York Times of having a liberal bias. Also under Wilcox and Bowman, the press shop went after Associated Press investigative reporter Michael Biesecker in the midst of a hurricane. Biesecker scrutinized whether EPA was adequately monitoring Superfund sites in the aftermath of Hurricane Harvey. He checked in with a team of AP reporters who had visited seven such sites in the Houston region. The original headline on his story: "AP EXCLUSIVE: Toxic waste sites flooded, EPA not on scene." EPA shot back with a press release calling the story "incredibly misleading." It said the agency had seen aerial imagery showing that 13 of 41 sites were flooded and "experiencing possible damage." And in an email obtained by The Washington Post, Wilcox told Biesecker, "You are an anti-Trump reporter. ... Folks know you are a dishonest reporter and it could be why the Associated Press moves you from beat to beat." Biesecker didn't respond to a request for comment for this story. Wilcox left the agency in July to become communications director for a GOP campaign (E&E News PM, Aug. 21). Bowman left the agency in May to work as communications director for Republican Sen. Joni Ernst of Iowa (Greenwire, May 3). Wheeler and his staff took a different tack after Pruitt's exit. The press shop has maintained a small team of staffers led by John Konkus, who previously worked as a Republican political consultant and helped on Trump's presidential campaign. It also includes Michael Abboud, a former Republican National Committee analyst; Molly Block, a former House GOP staffer; and James Hewitt, another RNC alumnus and the son of conservative talk show host Hugh Hewitt. Konkus has been involved with EPA from the very beginning of the Trump administration, serving on the agency's transition and "beachhead" teams and helping to guide Pruitt's confirmation in the Senate. In his early comments after Wheeler took the helm, Konkus promised a more open EPA. "You can expect a change in approach, and in this case a change in tone, as well," Konkus said in July, noting that Wheeler had already said he puts "a premium on transparency." "I think you can take that mindset and apply it across the board when it comes to how EPA will be communicating with the media and the public going forward," Konkus added. In his first two weeks on the job, Wheeler published his daily calendars, agreed to interviews with a range of news outlets and gave advance notice that a meeting in Pennsylvania would be open to press (Greenwire, July 18). But since then, EPA has been getting personal again. The agency's actions have been scrutinized in the press in recent weeks, and the public affairs shop has been hitting back. A Nov. 1 press release from EPA titled "Fact Checking Seven Falsehoods in CNN's Report" blasted a CNN article about agency guidance on the ground-level ozone standard. The press release went on to criticize seven "errors" in CNN's reporting — including the headline. 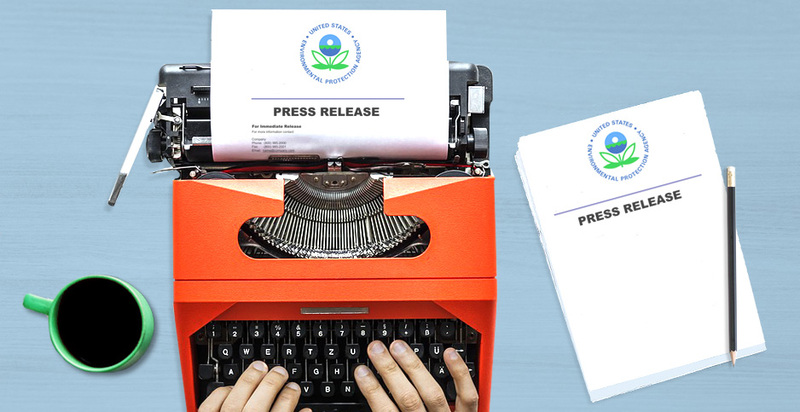 "EPA Sets the Record Straight After Being Misrepresented in Press," read a separate Oct. 30 press release attacking news reports about EPA's efforts to address cancer-causing emissions from an Illinois facility. Konkus declined to be interviewed for this story, saying, "We will pass." He didn't respond to a follow-up emailed list of questions. Some supporters of the Trump administration say the EPA press shop's aggressive tactics are justified. "I do think that the EPA has an active press operation. I think correcting factual mistakes is a legitimate part of that," said Myron Ebell, a former Trump EPA transition team head and director of the Competitive Enterprise Institute's Center for Energy and Environment. But former EPA press officials say the new approach is unprecedented. "I cannot recall anyone in the Obama administration putting out a press release directly attacking a media outlet," said Liz Purchia, a former EPA spokeswoman under Obama. "That's not the role of a government agency." She added, "Your job is to communicate effectively your agency's policies and priorities, not to attack the press. If you have a disagreement with a reporter or a media outlet, you should work with them, not make personal attacks against the media outlet." A source who worked in EPA's press office for several years echoed these sentiments. "It's just completely extraordinary for me to see a press release used to criticize a reporter or an organization for a story where EPA may take issue with some of the things that are written," the person said. "The way things were done was never to use the agency's letterhead and its press resources for criticizing a reporter," added the source. "And there were numerous times that we disagreed with what was published." Former EPA chief Bill Reilly, who led the agency during the George H.W. Bush administration, said his relationship with the media was "generally quite positive." He recalled "just once expressing objection to a newspaper article," which he thought drew the wrong conclusions about a memo he had sent to EPA staff. "I knew personally several of the reporters who covered EPA," Reilly said. "Neither my press office nor I would have attacked a journalist." Bill Ruckelshaus, who was EPA's first administrator during the Nixon administration, was brought back to calm the waters after the resignation of President Reagan's embattled first administrator, Anne Gorsuch Burford. A central part of that, he told E&E News earlier this year, was increasing press access. "The only way to restore trust is to open the whole thing up. That's what we did back in the '80s," he said. He invited reporters to attend monthly lunch meetings. "They'd all come up; it was completely on the record. Anything they wanted to ask was all right with me. They used to all show up for fear that somebody would say something important," he said. Observers say EPA's press shop may feel pressure from the White House to criticize what it deems "fake news" — a rallying cry for Trump's base. "It just seems like more of the Trump administration's M.O. of trying to undermine the credibility of any reporter they disagree with," said Magill. Trump has made CNN a favorite target of his Twitter tirades and remarks at "Make America Great Again" rallies. The president earlier this year tweeted out a doctored video showing him wrestling and punching a figure whose head had been replaced by the CNN logo. And on Wednesday, Trump clashed with CNN reporter Acosta in a testy exchange. "CNN should be ashamed of itself having you working for them," Trump said during an afternoon press briefing. "You are a rude, terrible person." The White House subsequently suspended Acosta's press pass. Press secretary Sarah Huckabee Sanders also tweeted out an apparently doctored video showing Acosta making physical contact with a White House intern trying to grab his microphone. So it came as little surprise when EPA issued its CNN criticisms last week, said former EPA spokesman Conger. The EPA press release took issue with an Oct. 31 CNN story headlined "EPA quietly telling states they can pollute more." The story focused on an Aug. 31 EPA guidance memo for states seeking to determine whether upwind ozone from outside their borders was contributing to compliance problems with the 2015 ozone standard. EPA's press office said the CNN story "blatantly mischaracterizes" the guidance document, adding, "Despite spending nearly two hours with EPA Clean Air Act experts on the phone and receiving numerous pages of email responses, CNN failed to report virtually any of the facts provided in detail. This is a great disservice to the public who now believe EPA is ordering states to 'pollute more.'" The EPA press release went on to list seven alleged errors in CNN's reporting, from its characterization of smog to its calculations of cross-border ozone pollution. But John Walke, clean air director with the Natural Resources Defense Council, leapt to the news outlet's defense. "Every single one of the agency's so-called corrections were erroneous themselves," he said. CNN accurately reported that the guidance document would allow states to pollute more, Walke said. Konkus even admitted as much in the article, he said. "John Konkus' views in the story ratified the criticism like mine that the guidance was intended to give states permission to pollute at higher levels," Walke said. "The CNN article damningly paraphrased comments by Mr. Konkus that confirmed that criticism. And so my personal view is that's what led to this really extreme, objectionable and fundamentally false overreaction by the EPA press shop." Konkus didn't respond to a question about whether the press shop reached out to the three CNN reporters who contributed to the piece. CNN spokeswoman Barbara Levin didn't respond to a request for comment. But after Trump clashed with Acosta on Wednesday, the news outlet said in a statement: "This President's ongoing attacks on the press have gone too far. They are not only dangerous, they are disturbingly un-American." The Obama EPA was also no stranger to criticism. From 2009 to 2017, the agency was a popular punching bag for conservative news outlets and politicians of the opposing party. Under the leadership of Tom Reynolds, an Obama campaign vet, EPA's press office sought to combat a barrage of attacks lobbed at the agency's regulations, science and staffers (Greenwire, Aug. 7, 2014). Reynolds headed up EPA's public affairs office for nearly 2 ½ years, using media tactics he had honed on the campaign trail and during his time deflecting scandals in the Energy Department's press shop. Reynolds now works on "policy communications" at Facebook, according to his LinkedIn profile. A Facebook spokeswoman declined to make him available for an interview. Purchia, who overlapped with Reynolds in the public affairs office, said she occasionally took issue with inaccurate reporting. But she said she always reached out to the relevant reporter to express her concerns, have a productive dialogue and in some cases request a correction. "You know, you have to pick your battles," she said. "Sometimes you fight harder for a correction and work with reporters and editors to provide additional background materials that they need for their story. If you feel like they don't have the correct story, you make your point." But, she added, "you're going to have to work with these reporters for your entire career in that position. It doesn't do you any benefit to just fight with them." Conger, who worked with Purchia, had a similar recollection. "There were many times when we took issue with the way a reporter or an outlet characterized the work we were doing," he said. "Our approach was to pick up the phone, have the conversation, work through those issues and not take that spat public." Magill, of the Society of Environmental Journalists, said he didn't remember the Obama EPA ever criticizing specific reporters in press releases. But he did recall concerns about access to information. "In the Obama administration, our primary concern was access, and EPA under Obama preventing reporters from having access to specific documents and talking to EPA scientists," Magill said. "But this [administration] obviously has ratcheted up any sort of opaqueness in the Obama administration quite a bit."